I went to Chicago for the first time this past September and this city definitely lived up to the hype. Unsurprisingly, I spent most of the trip on a scavenger hunt for the best food in “The Windy City”. With only 2 days in Chicago and two meals to eat out (because we had a guided food tour on one of the days), I had some tough decisions to make - so I consulted the locals for their advice. At the end of my first meal at an incredible Portuguese-Macau restaurant called Fatted Rice, I asked the waitress, “If you could eat just one meal in Chicago, where would you go?” She quickly replied, “Hands down, Avec.” The next day, a friend coincidentally booked us a table at Avec - that sealed our fate to dine there. When we showed up at Avec, a very tiny and narrow restaurant in Chicago’s West Loop, our waitress came by our table and we gave each other a long stare and paused. We knew each other, but how? I didn’t think I knew anyone that lived in Chicago beside my friend that I was already sitting down to brunch with. After running through some elementary questions, we realized that we both went to the same high school in San Francisco in the perpetually overcast Sunset district. It seemed remarkable that we remembered each other, despite not having seen each other in 12 years. The serendipity of all of these events made our last meal in Chicago even more indelible experience. So why does everyone love Avec? Because the food here is uniquely Chicagoan and undeniably delicious. Avec serves Mediterranean food with a Midwestern twist. Originally conceived as a wine bar with little nibbles, the food here became so popular that the concept evolved to offer the converse: a restaurant serving a great meal corroborated by stellar wine list. Avec is a Bib Gourmand, which means it’s a Michelin-rated restaurant that is recommended for its simple, yet skillful cooking, served at a reasonable price. The plates are meant to be shared, and the generous portion sizes (perhaps in thanks to the Midwestern influence) which ultimately left us rolling out of the restaurant. 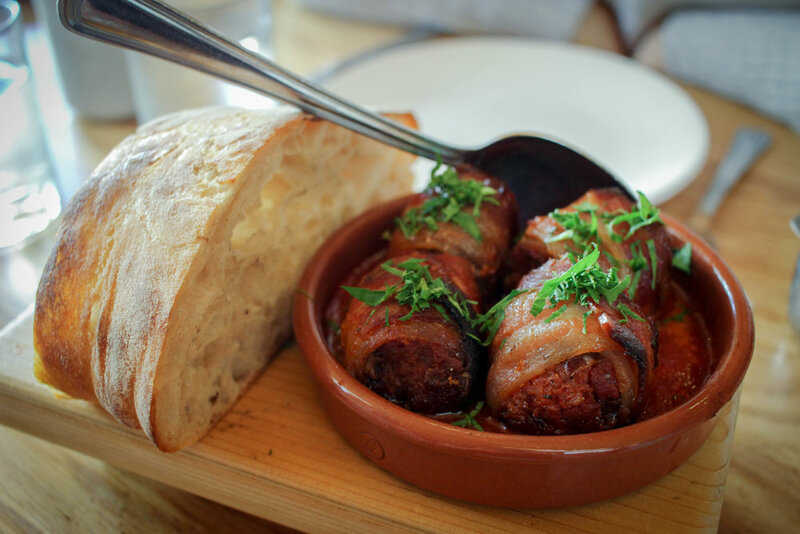 We started our meal with the appetizer that has elevated Avec to food-celebrity status: the chorizo-stuffed medjool dates wrapped in bacon and served in a piquillo pepper-tomato sauce. Never before have I had dates served in a spicy tomato sauce. This dish really had everything: sweet, spicy, savory, and umami. My high school classmate came out and generously surprised us with some sumac glazed pork belly. I’m not a pork-eater, but of course I had to try a bite of this thick, fatty, and caramelized bacon. I swooned when the spicy tomato shakshuka with tahini yogurt, pine nuts, and a wood oven roasted egg came out. We dunked the spongy insides of the homemade levain bread (seriously, how do they made so many incredible variants of bread here??!) into the mini cast iron pan to scrape out every bite of deliciousness. Next we shared the housemade hummus with a soft boiled egg, pickled red onions, parsley, and smoked harissa. The hummus came with pillowy, steaming hot, made-to-order pita bread. This was definitely one of the best pita breads I’ve ever had in my life. We ordered another whole pita bread and as I tore the bread in half, steam erupted from the freshly baked bread. We also shared a half portion of the wood oven fideo paella. Unlike most rice based paella, fideo paella is a Catalonian dish comprising of tiny noodles and traditionally paired with seafood. We had prawns, eggs, and preserved lemon aioli mixed into the fideo. Already so full, a half size portion (which isn’t on the menu) was definitely the right call. Though ready to call it quits from eating for the rest of the day, that didn’t stop us from trying every dessert on the menu. We tried a trio of confections: a Portuguese donut, a huckleberry gelato, and the custard yogurt with sesame crumble. Literally so full from brunch, I didn’t eat for the rest of the day. With a late afternoon flight to SF, this meal was the perfect finale to a weekend of adventurous eating.